Back in 2012, I was working at a bookstore in Guatemala City and Kazuo Ishiguro’s books always caught my eye but for a reason I can’t seem to recall, I never bought and read one, which is a shame because he then went to win the Nobel Prize in 2017 and everybody’s interest in his books piqued, and I have to confess my own interest returned. I finally picked one of his books, after my lovely sister recommended him to me. I was surprised to find out that Kazuo was born in Japan, but he grew up in England. The book I picked, The Remains of the Day, takes place in England and the story seems written like only a true Englishman would know how to. The Remains of the Day is about a butler at a big house, Darlington Hall, the house that once belonged to Lord Darlington but has recently been bought by an American gentleman. Mr. Stevens, the butler, narrates the book in first person and the story goes back and forth with his memories of the great days when Darlington Hall was frequented by great men and women, like Winston Churchill. 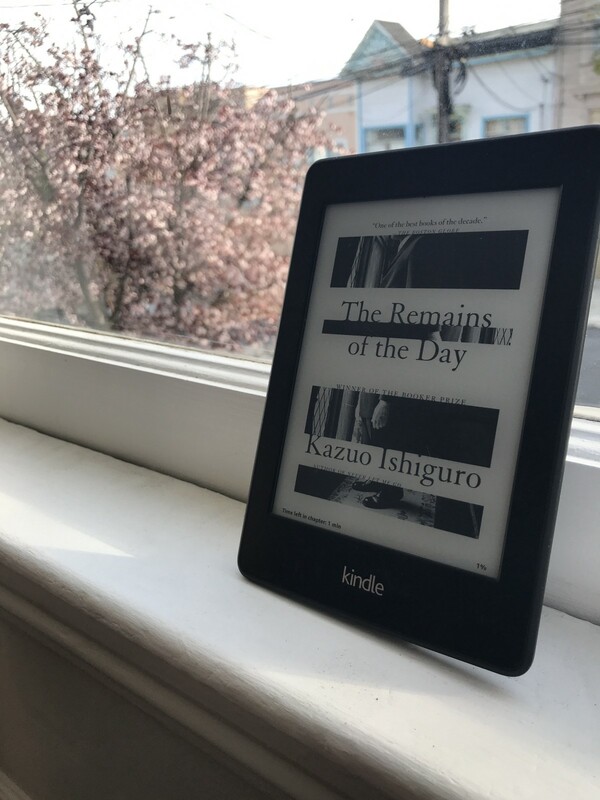 My Kindle copy of The Remains of the Day. Also the tree outside just bloomed! When they find themselves understaffed, Mr. Stevens goes on a trip across England to find Miss Kenton, who worked in the house as a housekeeper to try and see if she would like to return to her old job in the house. This trip is what made me pick this book from the rest. I love England and I myself once took a road trip around the United Kingdom. I was excited about a book that would talk about different places in England. I was a bit disappointed. The novel, though it does take us through different towns, barely describes them. The story is mostly in Mr. Stevens head, his memories and the small experiences he encounters on the road, but it is his memories which dominate and move the storyline. But even if the novel is not a travel book, as I had wished, it is an endearing story which hooked me up immediately and carried me from page to page. There is more to what we imagine of the relationship between Mr. Stevens and Miss Kenton, but it is not, however, a cheesy romantic novel, which I appreciated. It is a story of loyalty and dignity, of a man that knows nothing but to be the best butler to a great Lord. The Remains of the Day is a good winter read, a story to cozy up to with a nice, warm cup of tea.